Located in the heart of Bangkok is this wonderful royal Thai temple called Golden Mount which is simply a pleasant sight to experience. 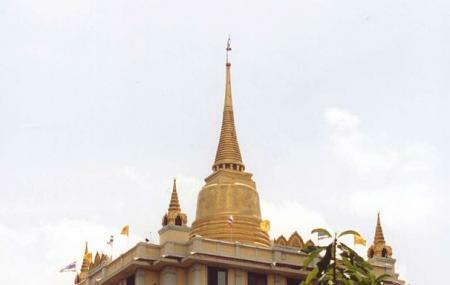 Also, popularly known as Wat Saket or Phu Khao Thong, the temple is crowned with a gold chedi which is about 58m in height. The temple is a relic of Buddha and welcomes many locals and tourists as worshippers all year round. If you happen to be in Bangkok during the month of November, you will experience the annual fair that is held weekly and is an outstanding gesture of praising Buddha. The temple is also home to many Buddhist Monks. The origins of this temple can be traced back to history during the Ayutthaya period and if you are with a tour guide, you will learn about the interesting facts and tales. How popular is Golden Mount? People normally also visit Wat Arun (temple Of Dawn) while planning their trip to Golden Mount. This may be the most amazing temple in Bangkok. It is so majestic. The variety of things you see there is remarkable. All the bells and gongs that you can ring are wonderful. Active worship was taking place all around us and they broadcast the chants from the monks from speakers. When you get to the top, the views are priceless and the winds feel refreshing. This was a very cool temple to visit. Well shaded on the way up. Plenty of activities and a beautiful service at the top. You don't have to be a Buddhist to enjoy the beauty and feeling of community when you visit. The coffee shop half way up also is reasonably priced and very comfy. Stunningly beautiful temple in the heart of Bangkok. The temple is easy to find, and once you're in the gate just follow the path from the ticket kiosk up to the top. The top is filled with super interesting statues, including a Buddha statue holding a glass orb. The view from the top is very beautiful as well; I was there on a polluted day so my visibility wasn't very good, but on a clear day it is quite nice. One of the highest photographs spot in Bangkok. Tourists need to pay a little fee for going up the temple. Best time will be 5-6pm. You can get sunset picture from this area. Then you can take night view while you are the temple. The main temple will light up so you can the shiny golden pargonda.